Black Activists in Missouri Are Fighting to Preserve the Right to Vote – Mister Journalism: "Reading, Sharing, Discussing, Learning"
BEFORE SHE DIED six years ago, Rev. Cassandra Gould’s mother used to say that “everybody marched with Dr. King” but that she had been in Selma, Alabama, “before Dr. King got there.” As a 19-year-old from a nearby town, she would ask an older cousin to drive her to the city, where she registered voters, joined sit-ins, and marched. For the rest of her life, she carried a gash on her thigh, a reminder of the police officer who shot her on March 7, 1965, “Bloody Sunday,” the day that perhaps more than any other precipitated the passage of that year’s Voting Rights Act. Gould and her siblings grew up faithful to their mother’s directive — “If you don’t do anything else, you vote” — but never experienced firsthand the ferocious racism of those days. Gould moved to St. Louis, Missouri — “Mississippi North,” as she only half-jokingly calls it — and became a reverend and activist. She quickly learned the subtle and insidious ways in which racism had survived and adapted in the aftermath of the civil rights era, but like many of her generation she remained relatively sheltered from racial violence. 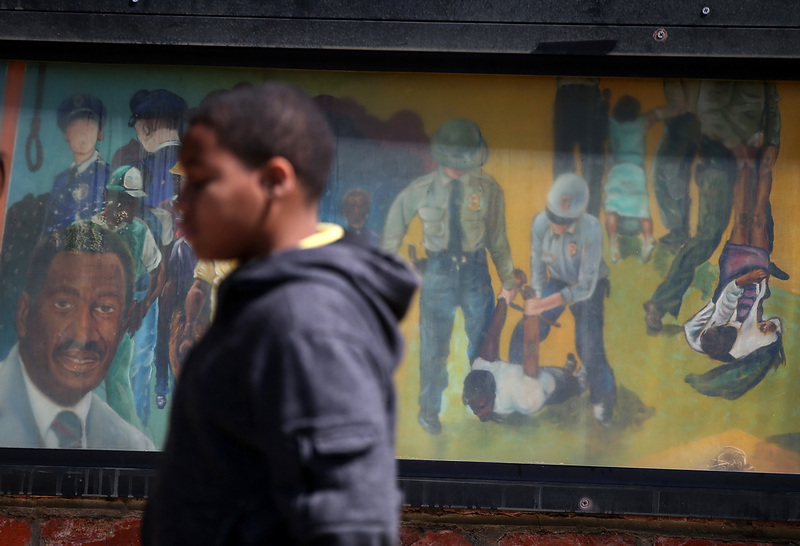 A mural depicting police violence during the 1965 Selma to Montgomery civil rights march. March 6, 2015, Selma, Alabama. Something else she never thought she’d be doing in 2016 was fighting to preserve the right to vote. Yet that’s exactly what she and dozens of other black activists have undertaken across the country, some for the second timein their lives, after a 2013 Supreme Court decision gutted a major provision of the Voting Rights Act. The elimination of that provision, which required nine states and many other localities with a history of racial discrimination to secure federal approval before changing election laws and procedures, sparked a series of measures across the country effectively restricting access to the polls with a disproportionate impact, once again, on black voters.